Professional designer bistro chair in a beautiful Zebra Wenge finish. Ideal for every kind of up market restaurant or cafe area. Subtle design, complete with a strong chrome frame. 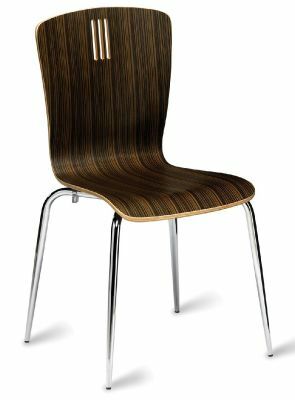 Subtle designer bistro chair in popular wenge finish. This chair is manufactured to contract standard, delivered for easy assembly. As this chair is a stock item you can expect a lead time of approximately three working days from order.